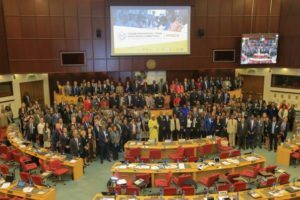 The landmark event, co-organised by the Global Alliance for Trade Facilitation alongside UNCTAD and other partner organisations, comes as Africa scales up its trade easing efforts after the World Trade Organization’s (WTO) Trade Facilitation Agreement (TFA) entered into force in February 2017 and as they prepare to implement the Africa Continental Free Trade Agreement signed in March 2018. A central provision of the Trade Facilitation Agreement is the obligation of each country to set up a National Trade Facilitation Committee (NTFC) “to facilitate both domestic coordination and implementation of the provisions of this agreement”. Well-functioning NTFCs with both public and private stakeholders have a key role to play in the implementation of the TFA which will make trade, easier, faster and more cost-effective, creating new business opportunities, enabling greater economic and social development and reducing poverty. The WTO predicts that if the TFA is fully implemented access to foreign markets will increase by 39 percent for developing countries and 60 percent for the least developed countries, with potential gains of up to US$ 50 trillion per annum for African exports. Trade facilitation reforms also support the implementation of the UN’s Sustainable Development Goals, such as through reducing food wastage due to delays at ports (Goal 2), automating and digitising processes helping to reduce gender-based discrimination (Goal 5), and promoting sustainable economic growth (Goal 8). Topics covered during the three-day event include the role of the African regional organisations, the role of NTFCs in the implementation of trade facilitation provisions in the Africa Continental Free Trade Agreement, paperless initiatives at entry points, the involvement of the private sector in NTFCs, how to coordinate border agencies, and the role of transit corridors. There will also be sessions on the gender dimension in cross-border trade, and the application of digital technologies in future modes of trading.